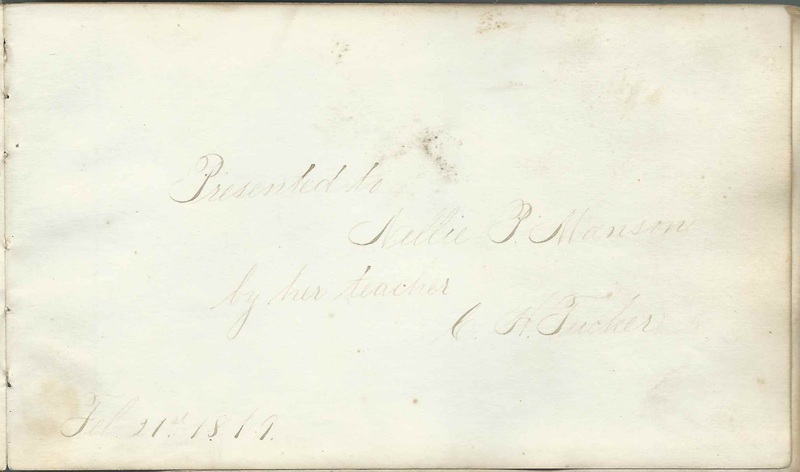 Autograph album presented to Nellie P. Manson of Salisbury, Massachusetts by her teacher C. H. Tucker on February 21, 1879. The album, which is thicker than average and a bit warped (which explains the rather blurry image above), measures about 6-1/2" by 4" by nearly 1". It contains the sentiments of around 70 of Nellie's relatives, friends and schoolmates, some from the Putnam Free School at Newburyport, Maine. Interestingly, the principal of the Eaglenest School at Newburyport, Massachusetts, Lloyd W. Hixon, inscribed a page in 1879. Perhaps Nellie attended both schools. Currier Huse  S Salisbury ? Nellie P. Manson was born about July 1865 at Amesbury, Massachusetts, the daughter of George Albert Manson and Sarah (Penel ?) Manson. Both parents inscribed pages in their daughter's album. Two inscribers with the surname Manson were presumably Nellie's siblings. The Annie Manson of Salisbury, Massachusetts; "P.F.S. 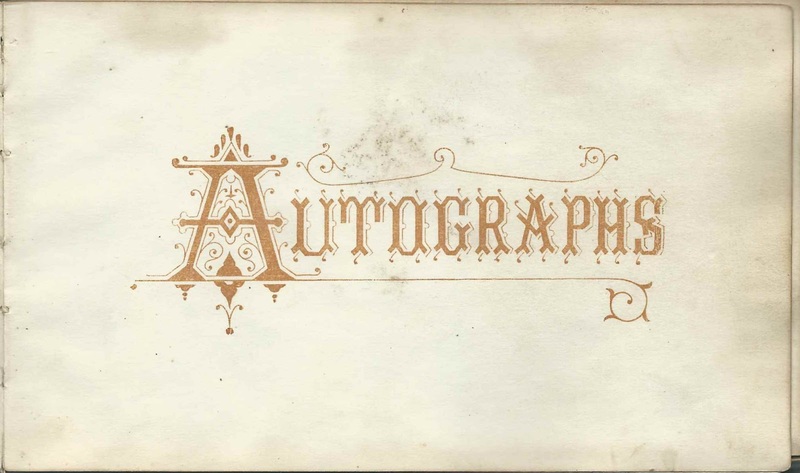 ", who inscribed a page was presumably Nellie's sister Annie Woods Manson. P. F.S. was presumably the Putnam Free School at Newburyport, Massachusetts. 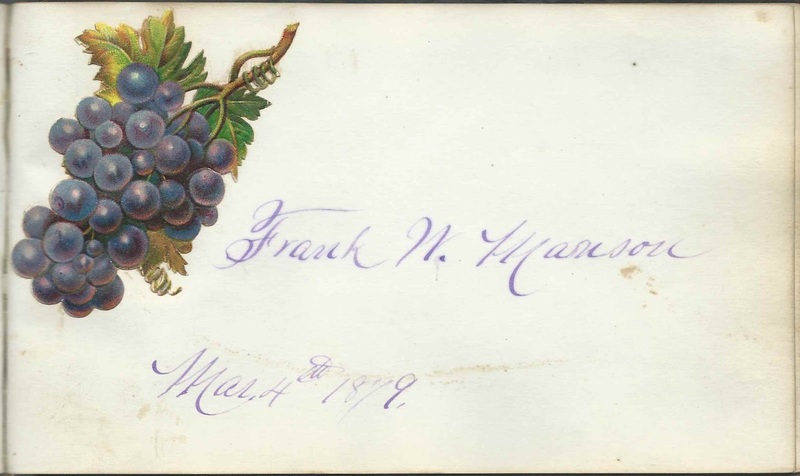 Frank W. Manson; inscribed on March 4, 1879. He was presumably Nellie's brother Frank Warren Manson. On April 30, 1891 at Rowley, Massachusetts, Nellie P. Manson married Eugene L. Gale, son of Joseph and Mary (Bartlett) Gale. By 1900, according to the U.S. Census, they were living at Amesbury, Massachusetts, and Eugene was working as a hatter. The couple had several children. Nellie died in 1922 and Eugene in 1939. They're buried in the Bartlett Cemetery at Amesbury, Massachusetts, along with at least two of their children. Saide L. Gove of Salisbury, Massachusetts; inscribed on February 22, 1879. I believe she was the daughter of inscriber Edwin Payson Gove. Saide's name appears as Sadie in most records. A. L. Huse of Newburyport, Massachusetts; inscribed at Herald Office, June 13, 1879. Presumably Arthur L. Huse, whose family was involved with the Newburyport Herald newspaper. Nellie P. Manson of Salisbury, Massachusetts; album owner. She was given the album by her teacher C. H. Tucker on February 21, 1879. He may have been Charles H. Tucker. Annie Manson of Salisbury, Massachusetts; "P.F.S.". Possibly Nellie's sister Annie W. Manson. P. F.S. was presumably the Putnam Free School at Newburyport, Massachusetts. Sarah E. Manson; inscribed at Salisbury, Massachusetts. Nellie's mother Sarah E. (Penel ?) Manson. Wording added later, along the left margin: "Mother Died Feb. 3rd 1884"
E. Merrill of Salisbury, Massachusetts; inscribed on February 27, 1879. Or possibly E. Merrill Salisbury. Albert G. Morton; inscribed at Salisbury, Massachusetts, on February 22, 1879. Presumably Rev. 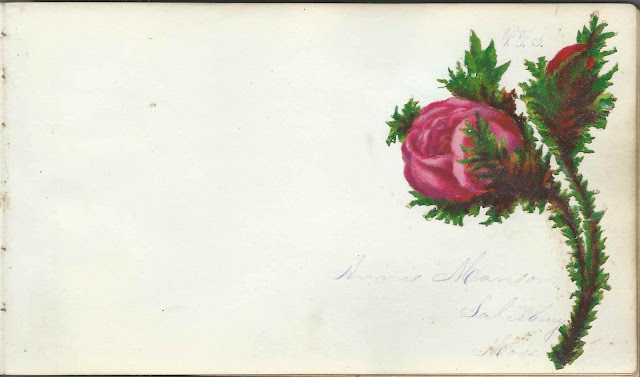 Albert G. Morton, whose wife Fannie (Williams) Morton also inscribed a page. 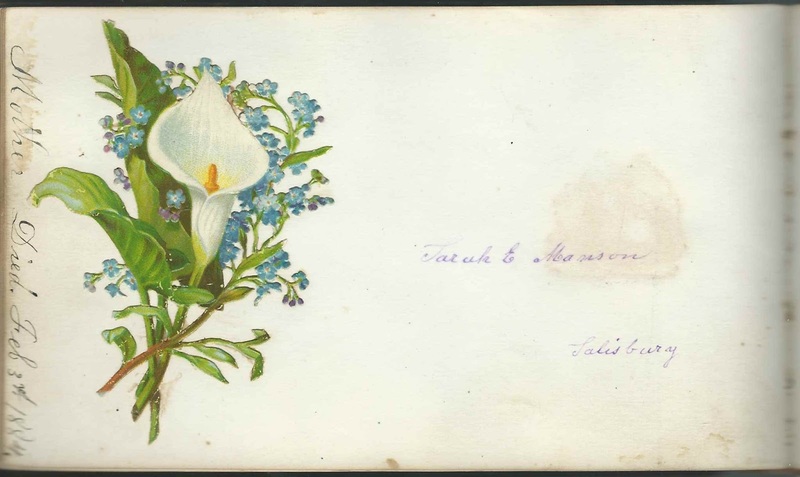 It's possible, however, that this page was inscribed by Albert G. Morton, Jr.
Fannie W. Morton; inscribed at Salisbury, Massachusetts, on February 22, 1879. She was Fannie (Williams) Morton, wife of Albert G. Morton. 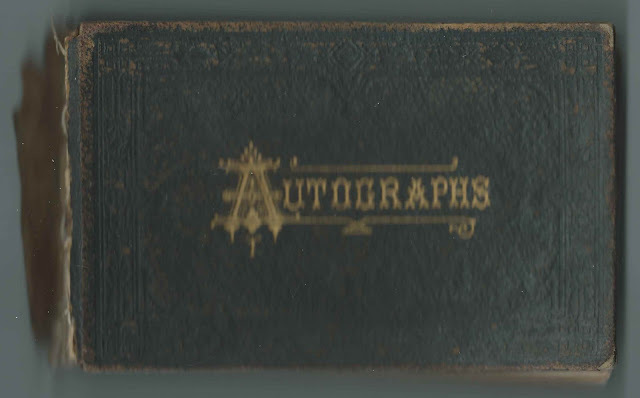 Either Albert G. Morton or their son of the same name also inscribed a page in the album. George L. Noyes, Jr., of Newbury, Massachusetts; inscribed on November 20, 1884. "Aged 9 yrs"
Mary N. Prescott; inscribed on May 21, 1879. The words "Passed away" appear along the left margin. Harriet Prescott Spofford. She was Harriet Elizabeth Prescott, a native of Calais, Maine, whose husband Richard Smith Spofford, Jr., inscribed the following page. They were living at Salisbury, Massachusetts, during the album's time frame. R. S. Spofford. A later note at bottom of page: "Passed away 1888". 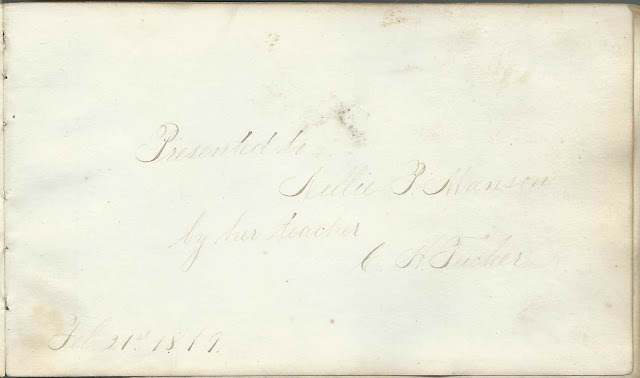 He was Richard Smith Spofford, Jr., whose wife Harriet Elizabeth (Prescott) Smith inscribed the preceding page. Aaron O. Swett; inscribed on March 26, 1879; his wife Ellen E. (Hanning) Swett inscribed the following page. Ellen E. Swett of Newburyport, Massachusetts; inscribed on March 27, 1879. She was Ellen E. (Hanning) Swett, whose husband Aaron O. Swett inscribed the preceding page. Edward Thornton, "H. B. M's Minister" or "H. R. M.'s Minister; perhaps "Her Royal Majesty's Minister; inscribed at Laurel Hill on October 21, 1879. Presumably Sir Edward Thornton (1817-1906), who lived for six years in a castellated house he built at West Newbury, Massachusetts. Read more about Sir Edward Thornton here. C. H. Tucker; gifted this autograph album to his student Nellie P. Manson on February 21, 1879. He may have been Charles H. Tucker. Willie S. Wilson of Newburyport, Massachusetts; inscribed on February 1, 1880; "Aged 12 years". 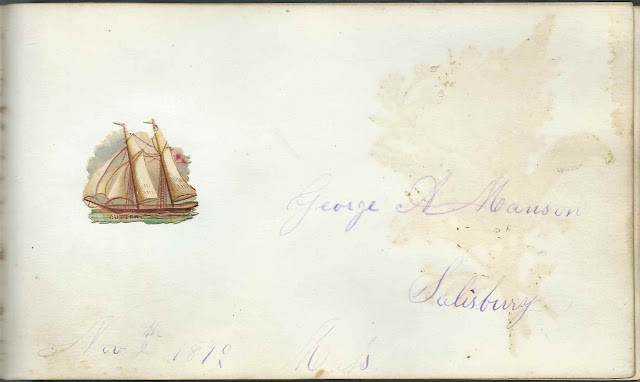 He sketched a schooner under sail. Lothrop Withington; inscribed at the Herald Office at Newburyport, Massachusetts, on June 13, 1879. The Newburyport Herald newspaper. Anna E. Woods; inscribed on Eastern morning, April 13, 1879. "the 52nd Birth day of your humble servent [sic]". Not sure of given name, but there was an Anna E. (Scott) Woods, wife of James Marshall Woods, living in Essex County, Massachusetts, about that time, who was born in about 1828 in Vermont.